Connecting generators in parallel increases the power capacity, control in load management, ease of maintenance, and redundancy. 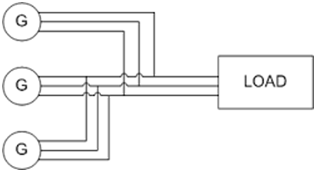 The process involves the physical connection of two or more electric generators, and the synchronization of their outputs. The synchronization matches the waveform of the output voltage of one generator with the voltage waveform of the other generator (s). Capacity: easy of synchronizing the system based on load demand; powering on a set when demand increases and switching off a set when demand decreases. Redundancy: ensuring a soft power transfer as the outgoing generator is switched off and the incoming one is powered on. The design should avoid a situation where the load is not powered or allowed to run on the UPS. Compliance with the electrical standards in terms of safely, protection and operation.